Open up my social media, and what do I find? I find no new news from the Chickenblogger. All quiet. Cluck, cluck, cluck. I suppose I could fill in for Natalie, and get you caught up on the this, and the that, here at the Bird House. Us chicas know a thing or two about pecking around and scratching up a little dirt. If there's anything worth knowing about, around here, then I am the Lady to share it. Let's begin with the countdowns. There seem to be several much anticipated events that everyone is eager for. 1. In three days Amira, Janece, and Paul will be living around the corner, and down the lane! How's that for newsworthy, and exciting? 2. In nine days Alex will be celebrating his IronMan birthday with all his friends, and cupcakes, and hats, and pizza, and fun, and games, and goodies! He is revisiting his fifth birthday celebration, when we broke out all the super heroic hoopla! 3. In eleven days Max will be promoted into high school! He will don a cap and gown, maybe. Or maybe we'll slip away and celebrate in our own quiet, family way. Either way, it's quite awesome that Max has passed such a successful year, and will be going to the school of his choice in the fall. 4. In twelve days our entire family will be together to cheer, and delight in the graduation ceremony at SDA. The class of 2012 is moving out of high school, and moving on to new places, new challenges. Immediate plans include summer jobs, driving classes, designing, making, and a few local adventures. Also, in the mix: birthdays, and father's day, and a Biergarten Party, and a graduation party, and more. There's always more, right? Whew! Ever seen a breathless chicken? Gosh, if I am cluck out of breath just listing some this stuff, imagine how Natalie, the Chickenblogger feels! She spent hours in the garden, yesterday, and again today. And everyone has been hanging out at the barn. Oh! Is there ever plenty of news there! You might never guess who's roosting in the barn... and, well, sorry, I guess we'll have to let the Chickenblogger share that news. I can tell you, they all enjoyed a really dear picnic. Even us chicas sampled a little crust of the feast. It was meant to be enjoyed in Balboa Park, where Alex, Suki, and Eli have art submissions in a SteamPunk Exhibit, at the Automotive Museum. I think maybe they were a bit in *recovery mode* from all other activities, because suddenly a park picnic felt like too much for them, and so they dined al fresco in their own backyard. Well, of course we thought it was a splendid plan, and we did not mind a bit when they dropped bits of pie, specks of quiche, and crumbs of their fresh baked bread. James and John were guests, and everyone enjoyed the long evening, and relaxing under the gray June sky. The cats are happy. They also like the longer days, the cool nights, the ample supply of garden mice. The goats eat and grow, and eat and grow, and well, you get the idea. I guess they are cute, and funny, and except when they are stuck in our feeder, we don't mind them, too much. Someone planted sunflower seeds outside of Sanka Bunny's home, and those should make a beautiful sight, which she can enjoy from her loft. As for us chickens... we find our pleasures in the garden too, and under the barn, and in the dirt. Zelda and Zoe are broody these days. I've heard talk of new chicks coming. It seems Geoff thinks big fat hens are wonderful, and speaking for myself, I quite agree. Well, if Natalie, the Chickenblogger, doesn't come out of retirement, then maybe I'll take over blogging! Cluck-peck-cluck-peck-peck.... typing's not so difficult. Happy Sunday, dear friends! 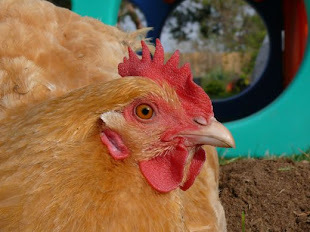 Wow, with all that's going on over there, Lady Betty, you must be all clucked out pecking through this long newsy post! Lady Betty, you are a wonderful ambassador for the oft misunderstood and underestimated domestic chicken. What a dear thing to fill in for the Chickenblogger. Lady Betty, you are truly a fine correspondent. So many good things are happening around there; I love hearing about them! You are hilarious! I loved hearing all the happenings from Betty and I bet it was fun to write. Sounds like your summer is off to a raging start! I so love Lady Betty pics! Hey -- tell Paul and family how happy we are for them!